Enter your email address to follow Painted Wooden Cubes and receive notifications of new posts by email. You may or may not have encountered the track cycling event known as the keirin. If you have, you’ll know it’s somewhat unusual. If you haven’t, let me explain. I’ll get around to board games soon. 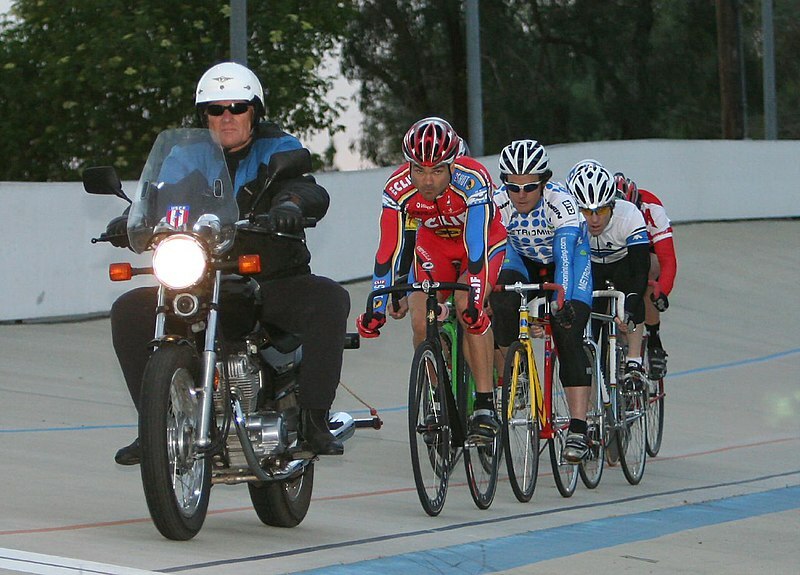 A keirin is contested by between six and nine cyclists, over a distance of two kilometres. However, for more than half of that distance, the cyclists must remain behind a pacing motorcycle, cycling in single file. The motorcycle gradually increases in speed – from 25km/h up to 50 km/h in a men’s race, and to a slightly slower top speed in a women’s race. The escalation is strangely captivating whilst watching: the rotation of the cyclists’ legs slowly becomes more rapid, while there’s a gradual change in tone of the motorcycle’s engine. But what’s most beautiful is the sense of suspense. With between one and two laps to go (depending of the length of the velodrome), the pacing bike leaves the track. Then and only then is the race on in earnest. Now the cyclists can overtake, pelting for the finish. A question might be asked as to the value of the prelude. There could, you might think, be more drama, more overtaking, in a straight two kilometre race. Part of the answer is that the keirin developed in Japan in combination with betting. I guess the early laps allow people to study the cyclists in motion before making bets. But, at the same time, action is more dramatic when it has been anticipated. The beginning of the race proper in the keirin is a hell of a lot more exciting than it would be without the buil-up, because you’ve had time to imagine it before it takes place. Probably a majority of board and card games have analogues to this tension and release of some form. I reviewed Stefan Feld’s Notre Dame a couple of weeks ago, and its plague track has some of this quality. Unless a player makes dealing with the plague a primary focus of his or her play, he or she will have to watch the rat marker creep along the track round-by-round, until it hits the end and ill effects are unleashed. That its operation is entirely open (a player knows how far the rat can move from the start of a round), makes anticipation a key part of the mechanism. With other games, it is the set-up before the game itself that works in this way. For instance, Pandemic and Airlines Europe each require that game’s draw deck to be seeded with special cards in somewhat determined locations: In the former epidemic cards (which spread disease) are added to sections of deck, while in the latter scoring cards are placed in partly controlled places. In each game, drawing anything from the deck is tense because of the knowledge that these special cards will sooner or later come. But then, there’s probably something even deeper here. In 2002 Stuart Albert and Geoffrey G. Bell published the article ‘Timing and Music,’ in the Academy of Management Review. It might seem a strange journal for an article about music. It is. They focus on harmony, rhythm and tonality – claiming that human beings innately behave in a rhythmic way. The board or card game, with its flow of turns and rounds, phases and stages, is deeply structured, and thus reflects something of our own innate rhythm back of use: the board game is a rhythmic item and so is the human being. Moreover, the board game suits anticipated pleasures – rather than the entirely unexpected – because a game’s passages of tension and release are largely predictable. But to what extent do individual players desire to take actions that harmonize with a game’s innate rhythm? By this, I mean do players on a subconscious level aim to participate in a rhythmical or musical performance – as Albert and Bell might imagine – or to disrupt it? I feel many players derive joy from discordance, but discord itself can become rhythmic. Of course, assuming legal play, a player is to some extent controlled in any game. He or she must build during a build phase, trade during a trade phase, say. But in many games – particularly those with character cards and other means of obtaining special powers, it can be legally possible to defy the base rules which structure a game. Few turns in a deck-building game will follow a single-action, single-buy structure (if those are the base rules of the game in question) – since so many cards will allow this to be defied. Many character cards in the space combat game Cosmic Encounter force the player to act in almost direct opposition to the game’s core rules. And these discordant elements are obviously what many players enjoy in each of these games: the chance to surprise, the chance to disrupt. But it’s not much of a release when it happens every turn. When my opponent throws down another killer combination in, say, Ascension, there’s every chance I’ll be looking out of the window when it happens. It’s not that interesting. Something similar happens pretty much every round in that game, and thus it becomes routine: this is then a rhythm of its own, albeit a syncopated one. Though true surprises can occur in games of this kind, their impact is weakened by all the impostors. More genuinely discordant play, I think, is more able to happen in more rule-bound games. Perhaps, say, a moment in a stock market based game, where you develop the infrastructure of a company you have little or no share in, because it prevents it performing an even more beneficial action. Perhaps the surprise sacrifice of a valuable piece in chess. Those are greatest moments of release: anticipated, in that something had to happen to vent the accumulated tension – but the form and timing of the release is unexpected. These are the board game’s equivalent of the wonderful, shock judder before the chorus, the surprise turn that makes a good solo into a great one. The break for the line from 300 metres out. And, because each play is a new improvisation, that solo, that break, will be different every time.